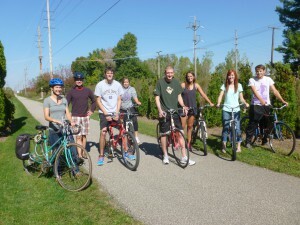 Business and Accounting majors from Goshen College teaming up with local bike enthusiasts and researchers Evan Bontrager and Andrea Milne to improve the bicycle trail system that connects their campus to the neighboring communities. Biking can be an invigorating, efficient and eco-friendly way to get from place to place – if the appropriate trails are in place. 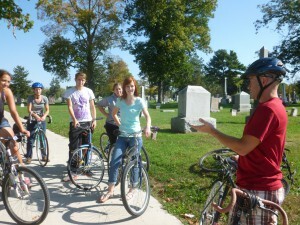 This fall six senior business and accounting majors from Goshen College are teaming up with local bike enthusiasts and researchers Evan Bontrager and Andrea Milne to improve the bicycle trail system that connects their campus to the neighboring communities of Goshen, Elkhart, Middlebury and Shipshewana. The purpose of the project is to track trail usage, identify possible improvements and estimate the economic impact of biking in and around Elkhart County. In so doing, the team hopes to enhance the experience of local bicyclists through increased awareness, functionality and funding of the region’s impressive network of trails. Discussing data collected by Bontrager and a group of volunteers on various segments of the trail system in August and September. There are two other aspects to the project: way-finding and parking. There aren’t many signs on the trails, and there are often unmarked intersections where riders are confused as to where they are or which way to go. 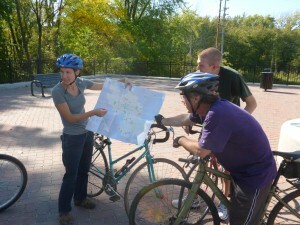 Way-finding involves biking the trails and surveying where one might go if a rider turns left or right at each intersection. In addition, parking will be enhanced by designing a brochure to promote the City of Goshen’s offer to provide and install parking “U’s” in front of local businesses for a cost of only $100 each. Retail stores, employers and schools will be targeted to help make their locations more bicycle-friendly. 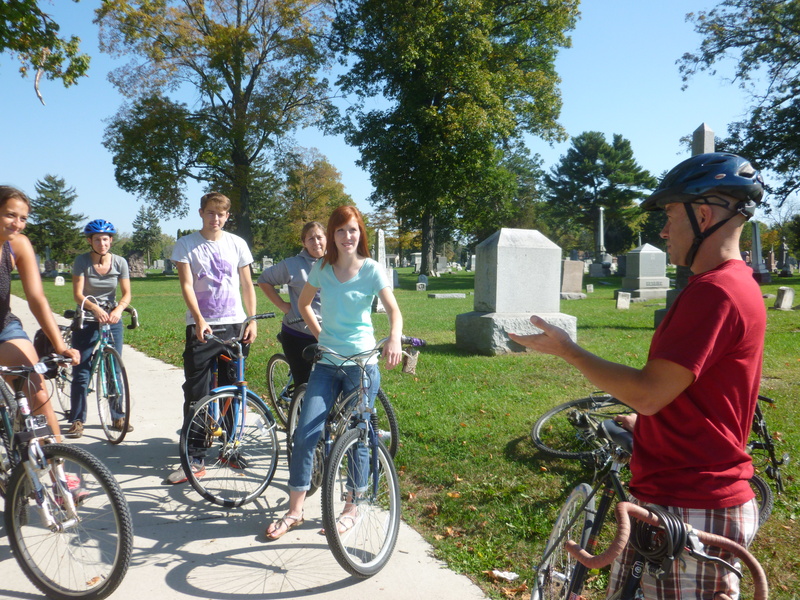 All in all, the project team hopes to enable biking to become an even more reliable and efficient form of transportation in the Michiana community. Editor’s Note: The students taking part in this project — Corine Alvarez, Tijs Buskermolen, Amber Falcon, Daniel Graber, Kyle Mishler and Chelsea Schmucker – are members of the Business Capstone class taught by Jerrell Ross Richer, Ph.D. Twenty-seven students are enrolled in the course this semester, each participating in a hands-on learning experience with community partners from the Goshen area. 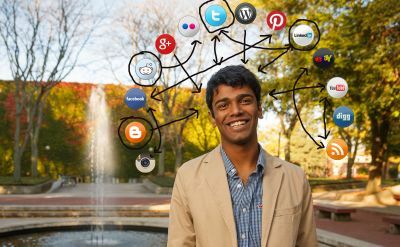 Articles featuring the projects conducted by the other students’ will be published over the next several weeks.